After one week at Club CHOA, we are home again, all together, under one roof. Everybody is in their respective beds, including the dog. It feels like family. We even managed to have dinner together at the dining room table in the midst of minor chaos getting Sutton’s meds picked up from around town. We have a new plan for Sutton and as complex as it seems to others, the alternatives were much more complex. During the last couple of days, we discovered that Sutton was aspirating formula into her lungs. Basically, she is inhaling formula into her lungs as she feeds. She had a feeding tube inserted into her stomach through her nose as a solution to the problem. The plan was to feed her for a few weeks through the tube and then re-evaluate to determine if she had improved to return to regular formula. The feeding sent her into fits so we went in for a swallow study. The study determined that she was in fact aspirating, but thicker formula changed the time it takes her to swallow just enough to correct it. This was good news as we weren’t going home with a feeding pump or tube at this point. The feeding process is a little more involved, but we will take it over the alternative feeding tube. The therapist seemed to believe the aspirating is due to her virus and congestion and hopefully will be gone at her follow up in four weeks. In the meantime, she gets to have rice cereal as a part of her formula. She isn’t complaining. She is also on a reflux med to ensure she isn’t aspirating from reflux. When we arrived home, we got settled in and were greeted soon by Hiatt and Mommy. Hiatt gave Sutton a get well soon card he made for her at school. It was such a good feeling and a proud moment to see our little boy speak of concern for his little sister. He would constantly make reference to her being in the hospital and include her in his prayers. He is going to be a great big brother. We are taking a new approach to illness for the rest of the cold season. We are going to steer clear of as much sickness as possible. We are probably going to turn into germaphobic parents and constantly clean everything. The main reason Sutton was in the hospital was for the dual viral infection, but not necessarily CF related issues. She would have been in the same situation, CF or not. It’s a bad season for colds, especially for infants. We just don’t want another hospital visit. We want to thank all of our family and friends for all of your support. So many people have offered to help us in many ways. It is easy for us to stay encouraged when we feel the love and support of those around us. We can’t express enough gratitude for everything. Many people say that Sutton is lucky to have us for parents, but she is lucky to have such an amazing support group behind her. Thank you from the bottom of our hearts. We are all Team Sutton Grace. So good to hear you’re all home!!! Welcome home Baby Sutton! The Jacksons are sending lots of love and hugs from California. Welcome home Sutts! We love you guys! this picture made me smile….big time! She is SO precious! Blessings to all the Burnetts! Great news. Her smile says it all!!! So glad everyone is back at home. 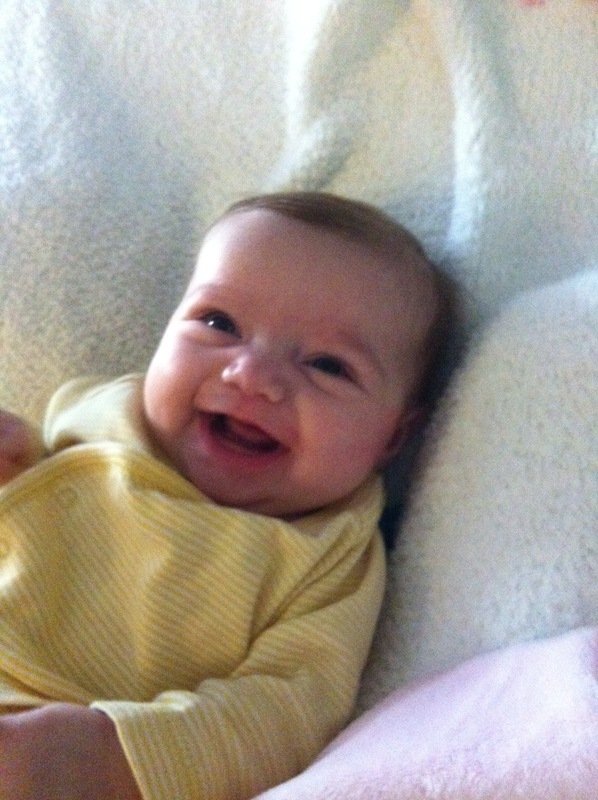 Sutton appears to be a very happy little girl regardless of all the medical attention she has had to have. she is growing so much. Loved to see her smile!